2 What is an assault rifle? 3 What is an AR-15? We need to, "Just ban assault rifles", "they are especially dangerous", "no one should own military grade weapons", or "it's not all guns, just these killing machines" demonstrates complete ignorance about guns, assault weapons, or bans. In other words, they are saying, "the biggest mass murders were in places with strict gun control, so we need to emulate them". Assault rifles are select fire and have been illegal since the 1930's. Assault weapons are a made up term to outlaw cosmetic features on weak hunting rifles like pistol grips or accessor rails. What the left calls an assault weapon are the most popular sporting rifles, and are a modular platform so any outlawed feature can be added/removed in 5 minutes. Their firepower is lower than most hunting rifles, most mass shootings are pistols. Places that outlawed them got near zero compliance, and they are easier to smuggle or make than most drugs. Main article: What is an assault rifle? Made up term: After Assault Rifle's were banned in the 1930's, in the late 1980's the far left and the media needed to invent a new class of weapons that weren't military Assault Rifles (guns that are fully automatic and can fire more than one bullet per trigger pull), but sounded like they were the same thing, to scare the uninformed into banning them too. So they invented the term "Assault Weapons" to intentionally mislead the public. And it worked, many uninformed people don't understand the difference. You can read more at: What is an assault rifle? or if you really want to dive deeper, there is: Reasonable Gun Laws which looks at how absurd these laws are, on what makes one gun more "deadly" to coastal progressives than another. The two halves go together with 2 locking pins: it takes about 10 seconds to take the gun apart, or put them together. All the parts and accessories are interchangeable, that’s why people like them — they’re modular — you can tweak and tune for what you want: it's the Lego's of gun construction. The AR isn't a weapon as much as an open source platform for accessories to build a weapon with. This is why it became the most popular target, sporting, training and hunting rifle in the U.S. Which leaves you with a problem: imagine you're the ATF, and you need to categorize which of these dozens of parts, is the gun? A barrel isn't a gun, nor the bolt, stock, grips, sights, magazines, and so on. All those are just parts and accessories. 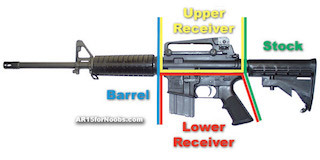 The only thing that's the gun, is the frame of the gun (lower receiver). That's what you register, stick serial numbers on, and control: just like a car. The frame is the car, the engine and body panels are just parts you put on the car. Now think harder. Imagine that a chunk of plastic or metal (the frame), is a gun. That's what you're trying to control? Right now, if you want to make an AR-15, which is just a chunk of plastic, wood or metal, you're trying to outlaw someone from carving, machining, molding, welding, gluing, printing, or otherwise making something, that was designed in the 1960's to be cheap. And really isn't that different than guns designed in the late 1800's, and people were making gun frames in the 1400's, with much more primitive tools and knowledge than we have. Gun controllers make luddites look like futurists! We're not some Island nation with civil liberties that are only "granted" by the queen. We have a history of innovation, determination, and revolutionary independence, combined with laws protecting against suppressing free exchange of ideas and free trade. Since you can't outlaw people making something, or buying the pieces to make something, there's a few dozen ways (and kits) for good guys (and bad guys), to make an AR-15. You make the frame, and everything else is readily available to buy/trade. But there are people that have made every part of an AR-15 themselves. I list just some of the ways to make one below. Machining - basically, machining is just using a drill press to grind out material from a blank piece of metal or plastic (or wood). On a complex shape, like an AR-15, it can be a bit time consuming. But on an AK-47, it's much easier. But the point is you can't outlaw what there's a profit in making. The only reason more guns like these aren't home made, is because they're cheap and available. If you made them harder to get, the black market would flourish. 80% lower - you buy a blank piece of plastic/metal, loosely in the form of an AR-15 frame, and grind out the firing group (trigger) pocket and a few holes. And you have an AR-15 frame, without a serial number. What the left really wants is to outlaw knowledge of how to make guns, or criminalize the thoughts of anyone who enjoys guns or gun sports. They just don't have the honesty or enough introspection to know how to elucidate it. Or worse, they know if they told the truth, they'd never get it, so they just lie. Even if you could outlaw AR-15 kits (you can't), there are dozens of ways to build a zip-gun (improvised firearm), from scraps around the house, or from $30 in parts at Home Depot. Google "How to make a zip gun" and and there are dozens of how to videos and diagrams. I designed and made my first gun around the age of 13 (it would put a .50 caliber pachinko ball through a garage door). Then I started making ones that would fire shotgun shells or other bullets. Most of those were single-shot designs, but now days making guns from kits and parts is easier. The uninformed imagine that at least they reduced firepower, but that only proves how little they know. Fully automatic weapon designs go back to 1862. A drill press and a mill vice is pretty much all you need to build anything, and those tools today are more powerful and versatile than anything they had in the 1860's. If a child is smart enough to plan out a mass murder (and defeat counter-measures in the process), then you have to be a complete moron to think they couldn't get or make an AR frame or other weapon (whether it was illegal or not). If prohibition works, we should try outlawing alcohol, drugs or prostitution. If you know gun history, you know that in 1779 we had the .46 caliber, 22 shot Girandoni Assault Rifle. It can deliver 88 shots in under 5 minutes (more than most mass shooters have done), was used to hunt bear or elk, and is why the Indians left Lewis and Clark alone on their journeys, and since it is an air-rifle (with the ballistics of a modern pistol) you can buy a replica or equivalent on-line, as a teenager. Tell me again how the bans can stop at just AR-15 like "tools of war". NOTE: Yes, we've had assault rifles since the revolutionary war, and only had a problem with school shootings after liberals gave us fatherless boys, gun control, gun free zones, violent TV/Video games, emptied our mental institutions, and then sensationalized every mass shooting on TV. Then they blame the gun for the problem. Rifles are used in the minority of killings or mass killings, and unless your victims are over 50 or 100 feet away (which they aren't in schools and buildings) pistols and shotguns are more effective anyways. You'd need to ban them too. And it's not just semi-automatics, it's also revolvers, pump, lever, and bolt action guns as well. Read Guns: Control or ban? for more on why no informed gun advocate buys the argument about reasonable gun laws or that a ban would stop at an AR-15. 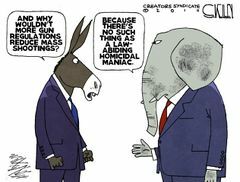 If the gun controllers knew what they were talking about, they wouldn't be arguing what they argue in the first place. But let's live in the delusions of a gun-controller and you outlaw AR-15's, what are the odds that you stop criminals from making this easily makable part? Or that there wouldn't blossom a black market for this stuff? Hobbyists are doing it already and have for a few hundred years. And the skills aren't hard at all, nothing a motivated teenager couldn't figure out. Pretend you're not a gun controller, and you can think cause and effect. If you take away crazies guns, they can easily go to even more destructive means to commit mayhem. Like driving cars into crowds, or various bombings and the like. (This happens in countries that outlaw guns). Which shows the problem -- it's NOT THE TOOL, it's the person who wants to commit mayhem. The more they research, the more they find better ways to kill people. So it's much better that you don't outlaw guns and leave Hollywood sensationalizing rifles, so they don't start thinking deeply about poisoning the water or food supply, or start thinking about ways to kill a lot more people. It's virtually impossible to outlaw knowledge, especially and retain the 1st amendment. So if you want to stand a chance of banning weapons, you have to eliminate the 1st amendment along with our 2nd, and then purge the Internet and Libraries of all information on how to make these weapons. Then suppress all Americans from browsing information from other countries (which might not comply with our censorship). You basically want to make Americans live in Communist China. Tell me that won't start a civil war. Read Guns: Control or ban? for more on why no informed gun advocate buys the argument about reasonable gun laws or that a ban would stop at an AR-15.